BRIAN REAGIN, now celebrating his twenty-first season as Concertmaster with the North Carolina Symphony, made his solo debut with the Cleveland Orchestra performing Tchaikovsky’s Violin Concerto. Since 1990, Mr. Reagin has made annual solo appearances with the North Carolina Symphony performing concertos by Vieuxtemps, Sibelius, Mendelssohn, Stravinsky and others. He has performed recitals throughout the United States and has toured Europe, the Pacific Rim countries, Africa and the Caribbean as a member of the Pittsburgh Symphony, and as a recitalist and chamber musician. A highlight of his extensive chamber music career was a televised performance of the Brahms B-major Trio with André Previn and Yo-Yo Ma. In 1991 and 1992, he performed Claude Bolling Jazz Suite for Violin with Bolling and his Trio, including a performance for French television. 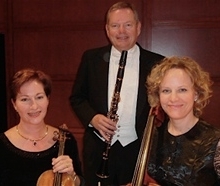 Brian Reagin’s studies have included coachings with the Guarneri Quartet, Mischa Schneider of the Budapest Quartet, Ivan Galamian and Josef Gingold. He has held faculty and Visiting Artist positions with Carnegie-Mellon University, the Cleveland Institute of Music and East Carolina University. Since 1996, he has been Concertmaster of the Chautauqua Symphony at the Chautauqua Institution of New York. Among his several commercial compact discs is the world premiere recording of the George Frederick McKay Concerto with the National Radio Symphony of Ukraine, recently released on the Naxos label. REBEKAH BINFORD is well known to North Carolina audiences for her extensive recital and solo work. Ms. Binford presently holds the position of Assistant Concertmaster with the North Carolina Symphony. She is frequently heard as a concerto soloist with the Symphony, her most recent contribution being a critically acclaimed performance and recording of Nathanial Stookey's Double Concerto with Concertmaster Brian Reagin and the N.C. Symphony. She also recently completed a recording of the Harold Schiffman Concerto for Violin and Orchetra in Budapest, Hungary. Ms. Binford attended Indiana University where she studied with James Buswell. She also worked with Ivan Galamian and David Cerone at Meadowmount and attended Tanglewood-Berkshire Music Center where she worked closely with Joseph Silverstein in orchestral, chamber and master class settings. Ms Binford performs regularly with the chamber group Aurora Musicalis and on the Jewel Edgerton Williamson Chamber Music Series at Peace College. She has performed on The Weymouth Center series in Southern Pines, the N.C. Museum of Art series in Raleigh as well as many other venues around the Triangle. She has premiered several works by contemporary composers, two of which have been dedicated by the composer to her. Ms Binford has been heard on national radio broadcasts from Tanglewood and Eastern Music Festival. She performs on a Sanctus Seraphin violin made in Venice, Italy in 1736. DAVID KILBRIDE is currently Assistant Principal Second Violin of the North Carolina Symphony. He received his BM from the Cleveland Institute of Music in 1993 where he studied with Bernard Goldschmit, Linda Cerone, Dr. James Stern and Kay Stern. David then joined the New World Symphony where he served as a rotating section leader and concertmaster. He was selected to perform with Georg Solti in the Solti Orchestral Project at Carnegie Hall in 1994. From 1995-1998 David was a member of the Hong Kong Philharmonic. Since returning to the US he has been Assistant Concertmaster of the Stockton Symphony & a member of the Pacific Symphony Orchestra & Opera Pacific Orchestras in California, the Richmond Symphony, and the Virginia Symphony in Norfolk, Virginia. He performs on a Georg Kloz violin, circa 1755. Violist CHRISTOPHER FISHER began his musical training at the age of three on the violin. Mr. Fischer began experimenting with the viola in high school and immediately fell in love with the instrument, switching at the age of sixteen. He went on to earn his Bachelor of Music degree at the University of Missouri, studying with Leslie Perna, followed by a Master of Music degree from Indiana University under the tutelage of Atar Arad. 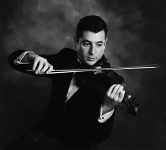 Shortly after graduating from Indiana University, Mr. Fischer won the position of principal violist and resident string quartet member with the Midland-Odessa Symphony in West Texas. As a member of the Midland- Odessa Symphony’s resident string quartet, Mr. Fischer played quartet recitals on college campuses and in public schools across West Texas. In addition to teaching a private studio, he also joined the faculty of the University of Texas at the Permian Basin as adjunct professor of viola. After a year in Texas, Mr. Fischer joined the New World Symphony in Miami Beach, Florida, conducted by Michael Tilson Thomas. As both a principal and section player in the orchestra he frequently performed chamber music as a part of the New World Symphony’s chamber series, including a concert with the Borromeo Quartet. Mr. Fischer has participated in several chamber and orchestral music festivals, including Aspen, Aria, and Bowdoin, where he studied with Heidi Castleman, Daniel Avshalomov, Helen Callus, Ralph Fielding, and Graham Oppenheimer. He also performed with professional summer orchestras including Spoleto Festival USA, the Missouri Chamber Orchestra, and the Southern Illinois Music Festival. Playing with the International Sejong Soloists, a chamber orchestra based in New York City, he performed nationally televised concerts at the Great Mountains Music Festival in South Korea. Mr. Fischer has worked with many of the world’s leading conductors, including David Robertson, Seiji Ozawa, Franz Welser Möst, Robert Spano, James DePriest, Gerhardt Zimmerman, and David Zinman. In addition to playing full time as the assistant principal violist with the North Carolina Symphony, Mr. Fischer teaches privately and is on faculty at Saint Mary’s School in Raleigh. ELIZABETH BEILMAN, a native of Wichita, Kansas, joined the North Carolina Symphony in 1988 and now serves as Associate Principal Cello. Since coming to Raleigh, she has performed in numerous recitals and ensembles in N.C. and has appeared as soloist with the North Carolina Symphony. Before her arrival in N.C., Ms. Beilman was Artist-in Residence for two years at the Banff Centre for the Fine Arts in Alberta, Canada. During that time, she toured throughout Canada, performed with Felix Galamir and with Menachem Pressler of the Beaux Arts Trio, and was featured at the Shawnigan Lake Festival in British Colombia. She is a co-founder of Aurora Musicalis. Ms. Beilman holds both Bachelor’s and Master’s degrees in Music Performance from the Indiana University School of Music. While at I.U., she held a faculty position of Associate Instructor and served as Assistant to Fritz Magg, Distinguished Professor of Music. Other cello teachers were Anner Bylsma, Aldo Parisot and Paul Tortelier. Her extensive background in chamber music includes studies with Rostislav Dubinsky, Josef Gingold and Peter Oundjian. She has recorded for the Albany label. Ms. Beilman performs on a Venetian cello made in 1921 by Giulio Degani. JIMMY GILMORE is a native of Dallas, Texas and is Principal Clarinetist of the North Carolina Symphony. He holds a Bachelor’s degree from the Eastman School of Music and a Master of Science degree from the Juilliard School of Music. Mr. Gilmore was formerly a member of the Rochester Philharmonic and the U.S. Military Academy Band at West Point. A faculty member of Duke University and Meredith College, Mr. Gilmore has made numerous appearances as a soloist and recitalist throughout the Southeast. In addition, he has appeared many times as a concerto soloist with the North Carolina Symphony. Chamber music has long been an important part of Mr. Gilmore’s musical life. He is a founding member of the ensemble, AURORA MUSICALIS and has performed in many recitals in the Triangle. Mr. Gilmore is also a published writer. His articles have appeared in Opus Magazine, The State Magazine, The Spectator and Clarinetwork. In 1989, his one-act play, The Picture Album won second prize in the Wachovia Playwrights Competition, a state-wide contest, He is currently serving as President of the Professional Musicians Association, A.F. of M., Local #500. KARI MILLER began playing the piano at the age of five. Originally from the Pacific Northwest area, she now resides tin Torrington, Connecticut. Ms Miller began her formal musical training at the Curtis Institute of Music in Philadelphia with Mieczyslaw Horszowsky and continued her graduate and doctoral studies at the Indiana University School of Music with Michel Block. Ms. Miller has been a featured soloist with many orchestras in this country and Europe and has performed numerous concerts and solo recitals in the United States. Her extraordinary musical collaboration with other distinguished artists is well-known, and she has toured worldwide with many of them, including the legendary cellist, Fritz Magg and saxophone virtuoso, Eugene Rousseau. Her musical association with Ms. Beilman began when both were students at Indiana University and she started performing regularly with AURORA MUSICALIS in 1998. Ms. Miller was awarded Second Prize at the prestigious Johann Sebastian Bach International Piano Competition in Washington, D.C. During the 2000-2001 year, she presented an acclaimed series of lecture recitals to commemorate the 250th anniversary of J. S. Bach’s death. Ms. Miller has recorded the music of Franz Joseph Haydn for the Coronet label. JOHN NOEL grew up in Henderson, North Carolina, where he began studying the piano at the age of eight. He left Henderson in 1985 to continue his piano studies and general education at the North Carolina School of the Arts in Winston-Salem, where he received a High School Diploma in 1988. Mr. Noel received a Bachelor of Music degree from the Oberlin Conservatory in 1993, a Master of Music degree from The Juilliard School in 1995, and a Diplôme Supérieur at the Schola Cantorum in 2002. He earned a Doctor of Musical Arts degree (DMA) from the Shepherd School of Music at Rice University in 2003. Mr. Noel spent three years in Paris as a recipient of a Fulbright Scholarship, a Harriet Hale Woolley Scholarship and a Société Générale Scholarship. While in Paris, Mr. Noel began his dissertation on the piano music of French composer Henri Dutilleux (b. 1916), following coachings with the composer and his wife, pianist Geneviève Joy. As a Fulbright recipient, Mr. Noel played concerts at the Fondation des États-Unis and the US Embassy in Paris, the University of Nice and the Fulbright Seminar in Berlin. Mr. Noel played solo and chamber music in Germany, Italy and Jordan as part of the 1987-88 International Music Program of the North Carolina School of the Arts. He performed contemporary music of young Finnish composers in Helsinki and Malmö at the 1994 New Music Festival for Scandinavian composers. Mr. Noel received an award for his performance of the “Chorale and Variations” of Henri Dutilleux following a recital at the 1993 French Piano Institute in Paris. He performed with the North Carolina Symphony in 1988 and received first prize in the 1986 Chopin Young Pianists’ Competition following a recital at the State University of New York at Buffalo. Mr. Noel maintains a private teaching studio in Raleigh. He is an adjunct instructor at Wake Technical Community College, where he teaches Music Appreciation and History of Rock.